In previous posts from March 17, 2013 "Was Clone Wars Intended for 8 Seasons?" and from May 19, 2014 "Brent Friedman Shares Details on Clone Wars Seasons 6 to 8", information regarding the plan to have eight seasons of Star Wars: The Clone Wars and that these episodes were already written has been shared. Seasons of Star Wars: The Clone Wars normally featured 22 episodes. Season Five of the series ended with only 20 episodes; however, three of the episodes that were originally intended for that season were not aired. These three episodes "An Old Friend", "The Rise of Clovis," and "Crisis at the Heart" were released as a part of "The Lost Missions" in March of 2014. With this in mind, the other 10 episodes of "The Lost Missions" compromised almost half of the episodes originally planned for season six of the Clone Wars, before it was cancelled. 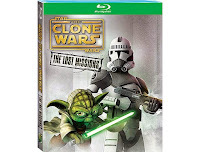 At that time, there were 12 episodes of season six and 22 episodes for season 7 and 22 for season 8, for a total of 56 episodes of Star Wars: The Clone Wars that were written and were unreleased in any format. This is an approximate number of episodes based on seasons one through four. In 2014, four episodes were adapted into the comic mini-series "Star Wars: Darth Maul: Son of Dathomir." From the concept art images released, these episodes appear to have been intended for the season finale of season six. They were labeled 621, 622, 623, and 624. This release left 52 episodes unreleased in any format. In the fall of 2014, four more episodes intended for season six were released as a part of the The Clone Wars Legacy. The Crystal Crisis on Utapau Story Reels, featured four unfinished episodes of the Star Wars: The Clone Wars. These episodes can been viewed at StarWars.com and they were included as a bonus feature on the "The Lost Missions" Blu-ray. Concept art for these episodes, appear to indicate that these episodes may have been intended to kick off season six with since they were labeled 601, 602, 603, and 604. As of this release, there were 48 episodes that remained unreleased in any format. Last year at Star Wars Celebration, four more story reels were screened. In late April 2015, the four story reels for the "The Bad Batch" story arc were released via StarWars.com as a part of the The Clone Wars Legacy. Concept art shows these episodes listed as 609, 610, 611, and 612. With this release, 44 episodes remained unreleased in any format. In July 2015, eight episodes of the Star Wars: The Clone Wars written by Katie Lucas were adapted into the novel "Star Wars: Dark Disciple," by Christie Golden. This story about Asajj Ventress and Quinlan Vos was a fantastic, and it wrapped up some loose ends from the series. From the concept art released, four of these episodes were intended for season six 613, 614, 615, and 616 and four episodes were intended for season seven. If you have not read the novel, and if you're new to Audible, you can sign-up for a free trail that includes two free audio books to check out this awesome Clone Wars story. With the release of this novel, approximately 36 episodes remained unreleased in any format. What Clone Wars stories are we still missing? Since the cancellation of Star Wars: The Clone Wars, there has been additional information revealed in various interviews, at various conventions and on twitter about these other approximately 36 unfinished episodes. 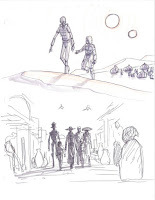 On March 10, 2014, StarWars.com released some of Dave Filoni sketches from the final writers conference. These sketches shows bits of pieces of some of the unreleased episodes, and a few of these are referenced below. The biggest release of information regarding these stories came from Dave Filoni and Pablo Hidalgo at Star Wars Celebration Anaheim. The Star Wars YouTube channel posted the video of the "Untold Clone Wars Panel" from the convention, on April 29, 2015. The hour long video releases lots of details about the unreleased episodes. The video is embedded below. Since the early days of talk of "Bonus Content," there has been lots of discussion of a bounty hunter story arc featuring Boba Fett, Cad Bane and Aurra Sing. One of Filoni's sketches shows the Bounty Hunters walking down a street. The "Untold Clone Wars Panel" revealed a clip of a story reel from this story arc. The clip was shown from 8:53 to 10:47 in the YouTube video. 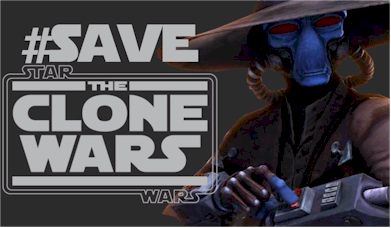 We learned that Cad Bane was mentoring Boba Fett, and they were on a mission to rescue a child from Tusken Raiders on Tatooine. There has been speculation that these episodes may have been left out of the Lost Mission due some possibility of these stories contradicting other upcoming anthology films. In any case, most story arc are four episodes, which would leave approximately 32 more unreleased episodes. The "Untold Clone Wars Panel" focused on two other story arcs. The first was The Wookiee story on Kashyyyk which would have featured the return of the Bad Batch. 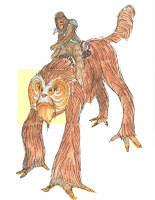 Filoni and Hidalgo discuss how the Wookiees were able to commune with giant tree spirits, and that they asked their permission to ride them into battle against Trandoshans that were allied with the separatists. Part of the battle plan was to burn a potion of the forest which caused some conflict between the Clone Troopers and the Wookiees. A clip of a story reel from this arc was shown in the panel from 18:24 to 20:16, in the YouTube video. There was confirmation of another Yoda arc by Brent Friedman on Twitter, and in one of the sketches shown in this portion of the panel, Yoda is shown with a Clone Trooper, with Yoda painted on it's helmet, and Chewbacca. If this would have been another 4 episodes arc, that would leave approximately 28 more unreleased episodes. There was also quite some time devoted to the episodes that became the Dark Disciple novel. Two story reels clips were shown at 28:16 to 30:49 and at 35:31 to 36:35. This story has now been told in the novel. During the lighting round potion of the "Untold Clone Wars Panel," they briefly touch on several stories, and they mention Ahsoka. However, they did not talk about how many episodes she would have been a part of. Footage was screened during the panel of Ahsoka riding a faulty speeder at 47:49 to 49:54. In an interview with Dave Filoni on USA Today last March, he revealed that there were "12 episodes of stories that explored Ahsoka's history and what happened to her after leaving the Jedi order" (A Jedi returns in 'Star Wars Rebels' finale). Filoni mentioned in his interview on "RebelForce Radio: March 13, 2015" that he has shown some footage of the Ahsoka stories, to the crew that works on Star Wars Rebels. These 12 episodes have not been released in any format, which leaves approximately 20 episodes not referenced at this point, with approximately five story arcs. The above mentioned "Untold Clone Wars Panel" at Star Wars Celebration shed some light on even more of the unreleased episodes. Filoni and Hidalgo revealed several more stories, but they do not discuss the number of episodes for the stories. Depa Billaba was going to appear in Clone Wars. They show the design of Oppo Rancisis' lightsaber, which was similar to Dooku's lightsaber. They show sketches of Senator Tikkes on Quarren. They show a sketch of a Sith Temple that lies below the Jedi Temple and a creature that lives in this area. They discuss a story arc that was described was Top Gun with Clones. They show a sketch of a Yuzhan Vong scout ship that would have came to check out the Republic. Hidalgo said it would have been like an alien abduction and like an episode of the X-Files. They show a 332nd Clone Trooper that was loyal to Ahsoka. The Clone Trooper helmet was painted with her facial markings. They also confirm that the end of Star Wars: The Clone Wars would have coincided with and gone beyond the events of Revenge of the Sith. 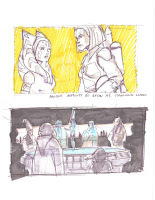 During the Q&A, Filoni reveals that he had a plan for Barriss Offee. Continue to tell Disney and LucasFilm that you want these untold stories from the Clone Wars. Thanks to Emma Blashington on the Facebook page, for pointing out that originally I left out the third Clovis episode "Crisis at the Heart," which changed the original total of untold stories of 35 to 36, which has been updated throughout the article. Great post, thank you. Rebals has had some nice moments, but it is no clone wars. Such a shame, I hope to hear more from the unreleased episodes soon. Great article! Might I advise to also use the hashtag #FinishtheCloneWars? It's pretty much in the process of being saved, as this article has aptly pointed out, so I think it's better to ask that it be finished. #SaveTheCloneWars it wasn't right if lucasfilm wanted to get them on air Netflix or something the rest of the episodes they would think of the people who care about this show I guarantee you will get the real viewers you desire. The vong were going to be in clone wars wars! Ah man I missed show so much! Any chance this article could be updated now that the Ashoka novel has been released? Are you going to update your article? There's plenty of new info. Disney executives are being so stupid and blind. They want to bring back the old trilogy's days of glory,but have completely failed to realize that the future of Star Wars can only be catalized through The Clone Wars cartoon. Get done with the stupid Rebels show and think BIG again. I think that the three together allow us to account for all your 20 missing episodes - a Padme arc on Mon Calamari, The Top Gun Rex/R2-D2 arc, The Vong Arc, An arc for Bariss Offee's fate, and an arc featuring Depa Bilaba. Would be really great if someone like Pablo Hidalgo could give us just a concrete little timeline list of what had been intended! I'm also fairly certain that the 12 Ahsoka episodes (3 arcs of 4) can be concretely identified as: The Coruscant Crime/Nyx Okami arc, The Sith Temple hidden under the Jedi Temple Arc, and The Siege of Mandalore series finale as detailed at celebration. Concerning the total number of episodes: actually 26 episodes are produced per production cycle/season, of which there were 7. It's a more logical determinant than the average amount released per season. That means 182 episodes: 4 of which were adapted into the TCW movie, 108 were part of the original run and 13 episodes were released via Netflix. That amounts to 57 missing episodes. 4 of those were the Bad Batch, 4 the Crystal Crisis, 4 the Son of Dathomir and 8 the Dark Disciple arcs. So that's another 20 episodes down. Meaning there's actually 37 episodes/stories left untold as of march 2017. We do know, based on this great page, quite a few of the 4-part arc: The Bounty Hunters arc, The Coruscant Crime/Nyx Okami arc, The Sith Temple hidden under the Jedi Temple Arc, The Siege of Mandalore series finale arc, The Wookiee/Bad Batch/Yoda arc, The R2/Rex Top Gun arc and The Padme/Mon Cala arc. All confirmed to be 4 episodes long, so that's another 28 episodes accounted for. Meaning there's only 9 (!!) episodes of which we know little to nothing, except that Barriss Offee, Vong and Depa Billaba (although she is apparently already in Dark Disciple) were set to appear.